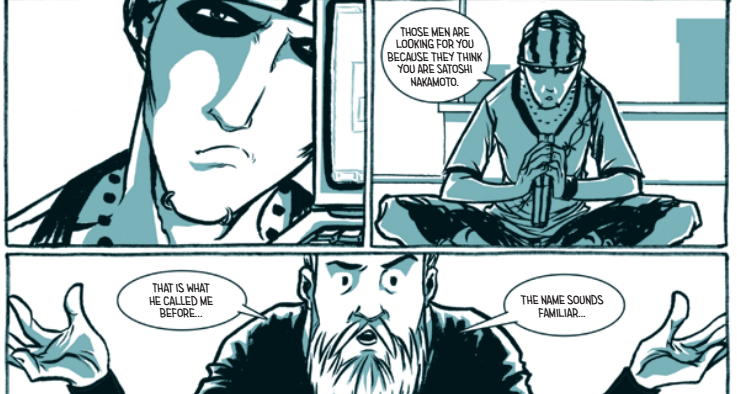 You may have heard of bitcoin-themed comic The Hunt For Satoshi Nakamoto already, and you’ll soon be able to read it. The team behind the book recently raised 119% of its 42 BTC target on bitcoin crowdfunding platform Swarm and is set to go into mass production. Creator Alex Preukschat said in an interview with Bitcoinist that the plan behind the comic was to reach as many people as possible and introduce them to the idea of what bitcoin is. With co-writer Josep Busquet and illustrator José Ángel García Ares, both seasoned artists in the comics world, he has delivered a way to tell everything important about the bitcoin story on a whole new level. No longer will you need to trawl through pages of internet forums and blogs to find out what makes bitcoin tick, the message is in this comic loud and clear. THFSN is set in a low-life/high-tech city peppered with all manner of tech, crypto, political and sci-fi references (see if you can spot them all), and populated by street-styled goodies and baddies alike. As a bonus, there are cameos you may recognize. Three parties are pursuing a list of men they believe to be Satoshi Nakamoto: one well-intentioned, one definitely not so, and one ambiguous. The latter two believe Satoshi to be their fast track to wealth and glory, while the mystery rescuer simply wants to keep the secret secret. The only thing they all have in common is that none of them know whether their current mark, a bearded and bewildered geek, is actually Satoshi. The fast-paced plot makes it very readable in a short time, and the occasional ultra-violence and action scenes are interspersed with characters delivering lines full of bitcoin history and philosophy. It all meshes together quite well. The team has been working on THFSN since October last year, and previewed their work to positive reviews at the CoinSummit conference in London in July. Before the success of the Swarm campaign, however, it was never certain the English version would come to market. Preukschat, who also edits sound-money news site OroyFinanzas, said THFSN had received support from big name bitcoin companies like Coinbase, BTCChina and Bitstamp, as well as identities like core developer Gavin Andresen. The Hunt For Satoshi Nakamoto has been translated from its original Spanish into English and Polish and will be published in those languages (paper and electronic form) in November 2014. The team is also seeking publishing partners in other countries from Norway to Japan. Its creators have also dedicated the story to the memory of the late cryptographer Hal Finney – who received the first bitcoin transaction, and whose affliction with increasing paralysis from the disease ALS forced him to retire from work around the same time Satoshi Nakamoto stopped communicating.